Taking good care of our health should be our number-one priority. We only have one body, that’s why we should never be doing things that can ruin it. Thankfully, there is a lifestyle questionnaire (usually called lifestyle survey questionnaire examples) that we can use to determine if we have a healthy lifestyle. The lifestyle questionnaire will help us get back on track on choosing a better lifestyle for our health. This questionnaire should be taken seriously as this can have a huge impact on our health assessment and to help us give appropriate solutions on the problems and issues we currently experience in our health. 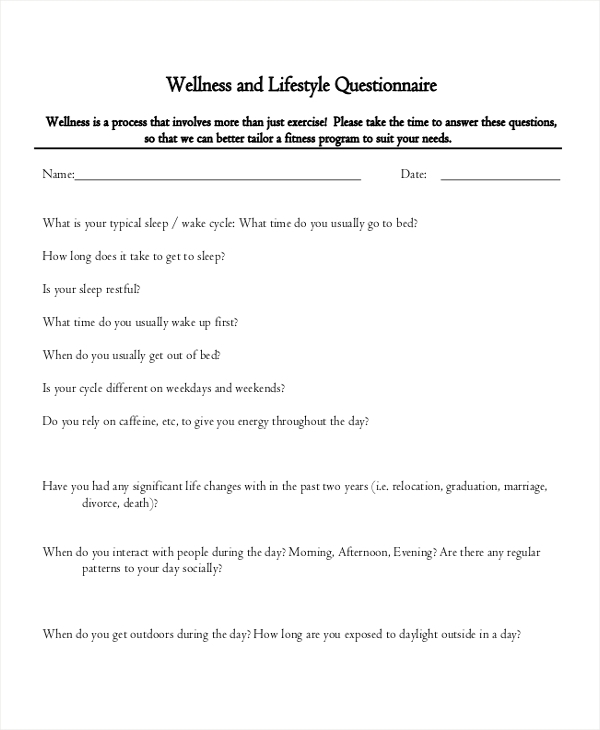 A lifestyle questionnaire is a list of questions pertaining to the health and lifestyle of a human being. This questionnaire is designed to help every individual understand their health and how it is affected by their lifestyle thus improving their well-being. 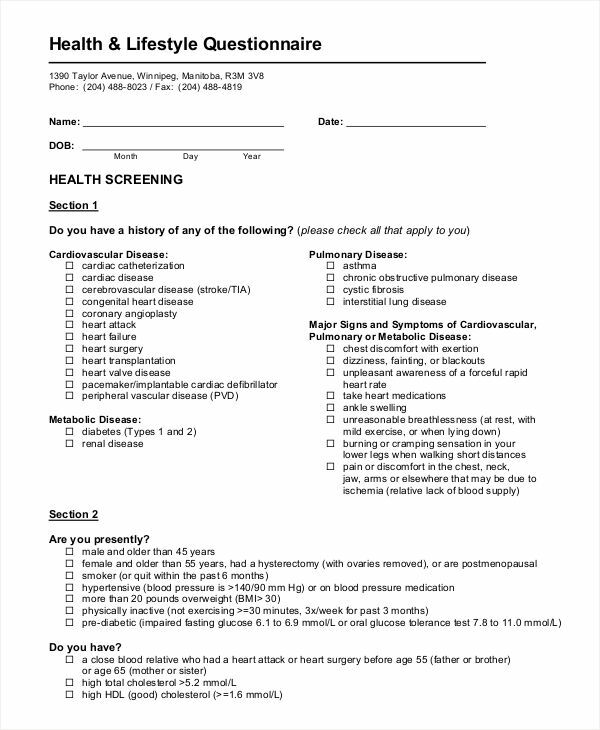 This questionnaire can be a part of a health promotion activities that is conducted by local or state health improvement agency. A lifestyle questionnaire can also be used to measure and to allow comparisons on the health of the people in that particular area. 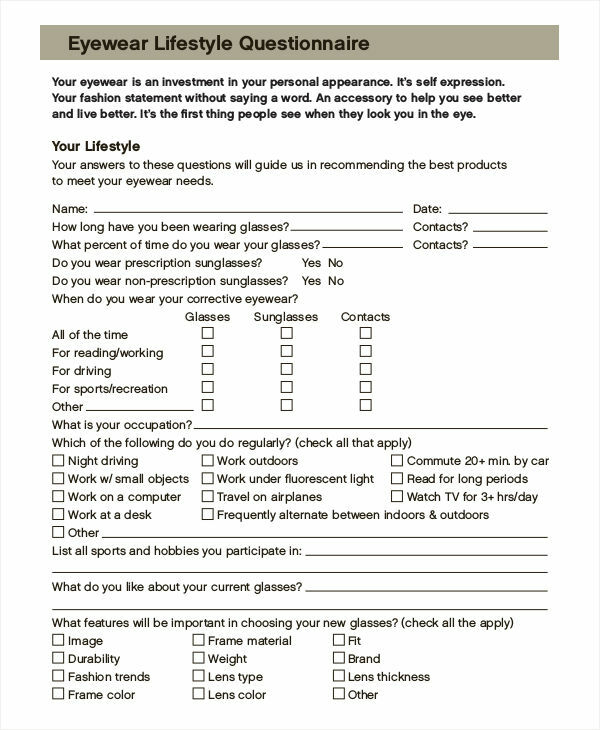 You can browse our lifestyle Questionnaire examples in PDF provided here. When you are part of a health improvement agency or just want to know the health status of the people living around you, then you know that the best way you can get information is through the use of a lifestyle questionnaire. Use simple language and avoid using complex medical terminologies. Focus on asking health related questions. Arrange the questions according to its level of priority. 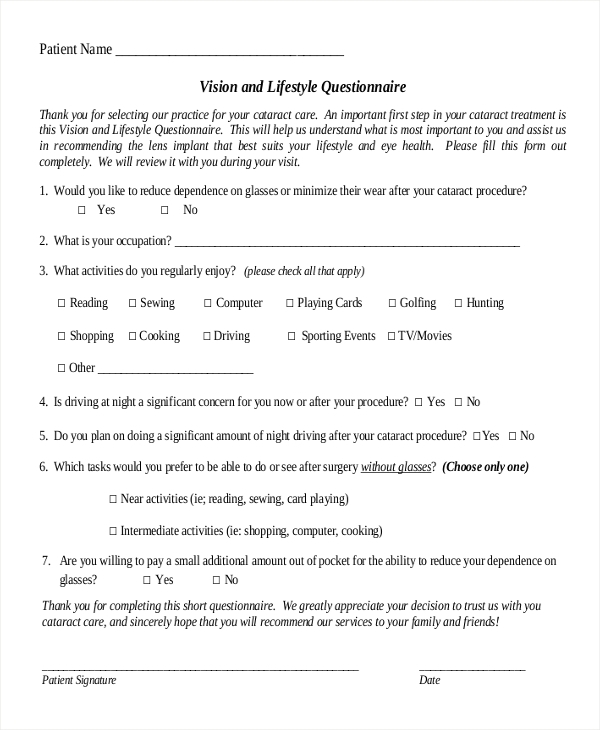 Or you can download our ready-made lifestyle questionnaire examples here. There are many reasons why lifestyle questionnaire is very important. 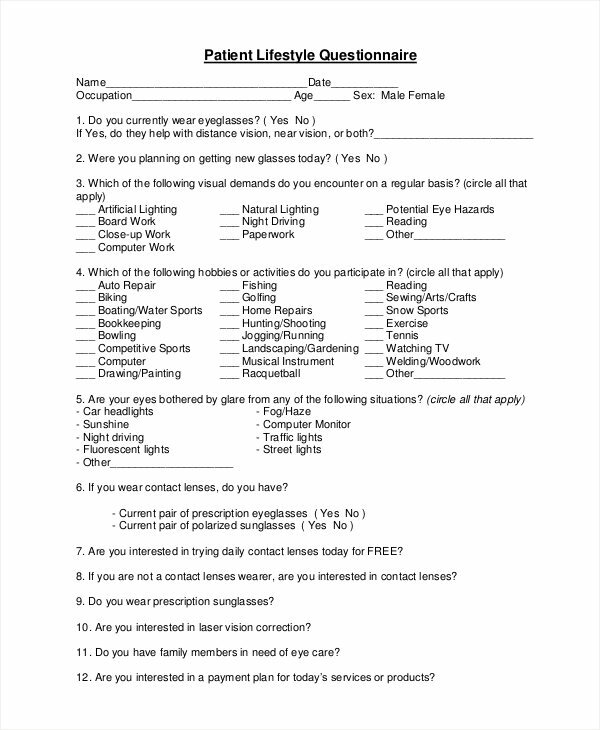 Below are some of the most important purpose carried by a lifestyle questionnaire. To point out health and lifestyle issues appropriately to improve the heath status of a person. Lifestyle questionnaire collects and gathers information that is vital for improving one’s health. To provide a foundation that will control the impact of an intervention that is created to improve the health and well-being. The information that is collected in a lifestyle questionnaire will be used to manage the circumstances that hinder in achieving a healthy lifestyle. To assess and evaluate the health and lifestyle of people in a particular area. 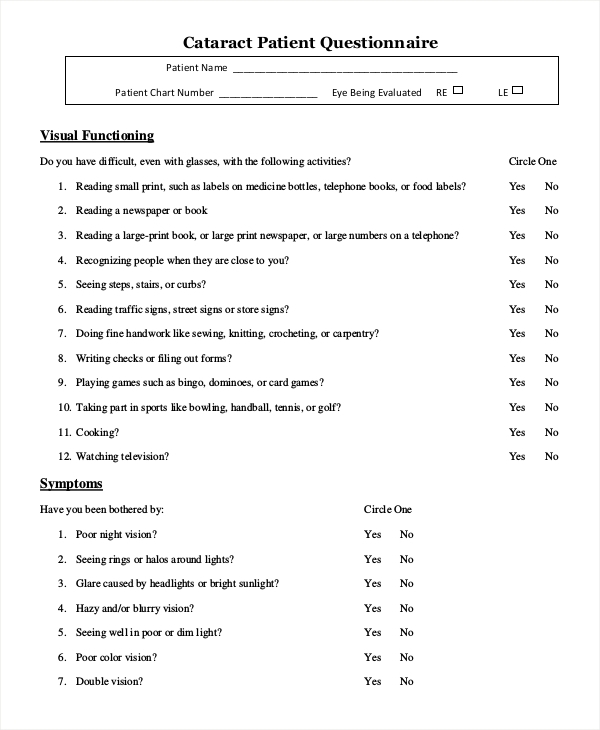 Lifestyle questionnaires are also used to measure the percentage of people in an area who have slight problems regarding with their health and lifestyle. To present new ideas and find solutions that are useful for the future action plan and new services. The result of a successful lifestyle questionnaire will be given importance and attention to be used in future health issues. And to give emphasis on the areas that need to be studied, especially in terms of health inequalities. 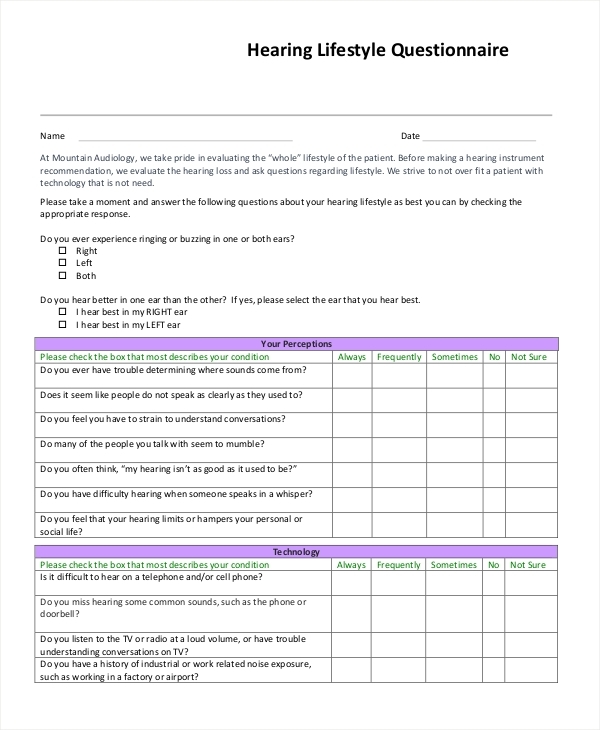 You can find all the importance and purpose of a lifestyle questionnaire in our lifestyle questionnaire examples in Word and service questionnaire examples here. What Is a Survey Questionnaire?